So hitch up that sleigh, jingle those bells and across the river and through the woods, to Rainbow Ag we go! December 1, 2016 at 6:15 PM, at both Rainbow stores. See you there! 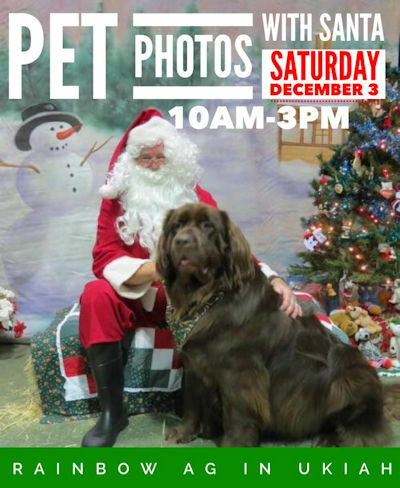 Pet lovin’ Santa will be at the Ukiah Rainbow Ag store on Saturday, December 3rd, for SNAP’s annual Pet Photos With Santa fundraiser! Get a fun photo of your whole family – furry members included – for a $20.00 donation to the Spay Neuter Assistance Program. All volunteer SNAP provides assistance to low income, feral cat and rescue groups. Help prevent animal abuse and shelter overcrowding – spay and neuter your pets! Santa will be at the store from 10:00 AM until 3:PM, and he will head outdoors for a photo with your pony if you wish! Purina shares a heart-warming story about a horse rescue ranch in Colorado. Part of Purina’s Home For Every Horse program, Far View Rescue was surprised by a donation from Purina, delivered by some very special celebrity equines! Check out the video here. Stuck for gift ideas? Check out Rainbow’s huge selection of Carhartt jackets, raingear, boots and more, for every member of the family. Beautiful jewelry from Montana Silversmiths, gift and home décor, toys for all ages, accessories like gloves, socks, beanie caps, belts and purses, Wrangler jeans … and don’t forget toys for the big boys like Outdoor Power Equipment from Stihl, Husqvarna, and Honda. There’s blingy tack for the horse-lover, garden supplies for the gardener, wild bird feed and feeders for the bird lover, pet treats, sweaters, and beds. Something for everyone at Rainbow Ag and with free gift wrapping always. Can’t decide? How about the perfect Rainbow Gift Card – available in any amount! When it comes to getting your holiday shopping done, Rainbow’s got you covered! Don’t your horses deserve a gift too? Get a new halter and lead, and save 20% with this month’s subscriber coupon. Any halter and Lead in stock, 20% off! Won’t that pony look pretty? Enter the Trivia contest to have a chance at a $15.00 Rainbow Gift Card! Last month’s winner is Mark Burgess and the correct answer is Rainbow is owned by a local family. This month’s question is, Who delivered the Purina Home for Every Horse donation? (Hint, it wasn’t Santa Claus!) Enter here! This entry was posted on Wednesday, November 30th, 2016 at 3:09 pm	and is filed under News, On The Right Lead Newsletter. You can follow any responses to this entry through the RSS 2.0 feed. Both comments and pings are currently closed.